In theory, concealer sounds like a magical product that gets rid of blemishes and under-eye shadows – however, it is not particularly easy to apply correctly, and tends to make for an odd, uneven, and patchy look if used by an inexperienced hand. Concealer cannot just be swiped onto the skin – instead, it needs careful blending to look natural and unobtrusive. In addition to getting the application method right, it is also necessary to buy the right shade, in order to use concealer correctly. Before applying any sort of makeup, make sure you begin with clean skin that has been washed and patted dry, in order to make sure there is no dirt or oil clogging your pores. For blemishes (e.g. acne scars) use a concealer that is dry and thick in consistency, and is exactly the same colour as your natural skin tone. Dip a fine makeup brush into the foundation, and dab the brush gently onto the centre of the blemish. Using your index finger (and your middle finger, if you need two fingers for more precision), start patting at the dab of concealer. This will warm it up, and help it spread and blend better. Keep patting and dabbing with your fingers until it is absorbed into your skin completely – do not attempt to smear or rub it onto your skin. Once the concealer has blended into your skin completely, study the area to make sure the blemish is completely concealed. If it is still showing through, you can apply another coat of concealer – however, just make sure you do not make it look cakey. If your skin becomes dry after the application of the concealer, you can use tweezers to get rid of dry skin flakes. If you are looking to hide under-eye shadows, it is necessary to buy a concealer that is one shade lighter than your natural skin tone. Dip the fine makeup brush into the pot of concealer, and then dab it onto the darkest part of your under-eye shadow – this will generally be the inner corner of your eye. Start dabbing the concealer with your fingers, moving outward to cover the entire dark circle. 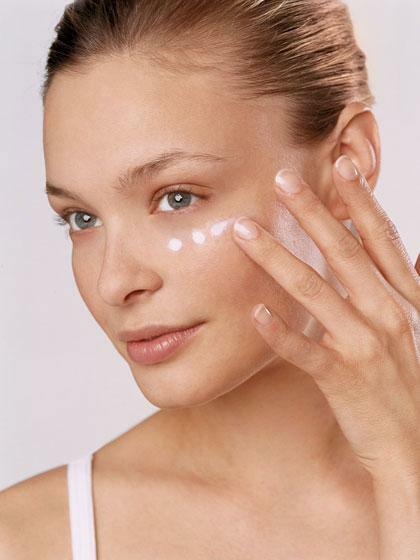 Pat it all over the area you wish to cover, moving back and forth from the inner to outer corner of your eye. Repeat the same process with the other eye, and make sure both eyes have an even layer of concealer.